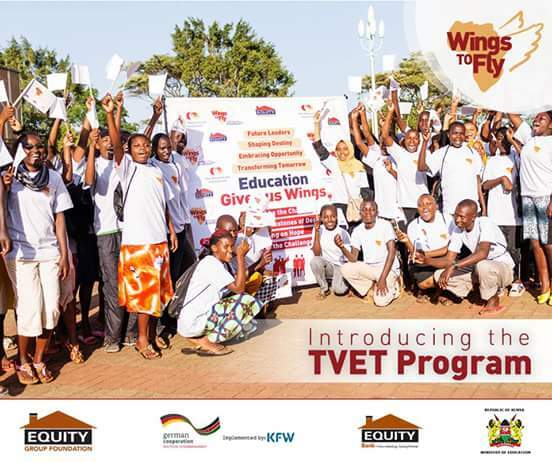 The Equity bank will be launching another wings to fly scholarship program for Technical and Vocational Educational Training (TVET) students on Monday 23rd January 2017 to fund wings to fly beneficiaries who graduated in 2016. Equity Group in partnership with the German Government through its implementing agency KfW, Ministry of Education, Science & Technology (MoEST) and Equity Bank, will on Monday, 23rd January 2017 launch nearly 3,000 scholarships to support #WingstoFly 2016 graduates join Technical and Vocational Education and Training (TVET) Institutions to acquire technical, professional and enterprise skills. The over 3000 stidents will join various technical colleges all over kenya.More details will come on after the launch.The move is suspected to have been born out of the urge to rescue the majority of wings to fly beneficiaries who scored below grade C+ during KCSE 2016.